Hundreds of transit leaders, workers and advocates erupted in applause this week, giving a standing ovation to Metro Transit bus operator Al Ramey as he was honored for 51 years of safe driving. 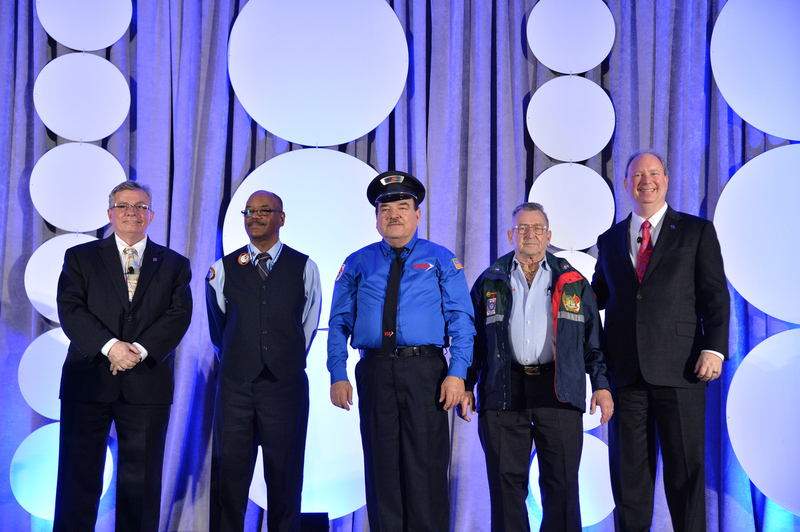 Metro’s Al Ramey and two other longtime safe bus operators, May 4 at the APTA Bus & Paratransit Conference in Kansas City, Mo. From left: APTA Chair Peter Varga; Ralph Spain, Maryland Transit Administration, 42 years; Jess Quintero, VIA Metropolitan Transit, 48 years; Al Ramey, King County Metro Transit, 51 years; and APTA President & CEO Michael Melaniphy – Photo by Steve Puppe. Ramey beamed under the bright lights at an American Public Transit Association conference in Kansas City, Mo. Ramey drove into Metro’s record books when he reached the 50-year safe-driving mark in 2013– unheard of for a public transit operator. On the national stage, he was joined by two other drivers with 42 years and 48 years safe driving honors from Maryland and Texas. They flashed the names on giant screens, Ramey said, as the three names were called. With sharp wit and a quick laugh, Ramey, 82, still drives Route 150 between Kent and Seattle each morning, and is one of the agency’s most recognized safety ambassadors. Bus driving has been a lifelong career for Al. He first was hired by Seattle Transit in 1952, later working for Suburban Transport Service, which became Metropolitan Transit. In 1992 he was named Metro’s Operator of the Year. In 2000, he received a 3 million miles safety award from the National Safety Council.